Nantwich was noted for its leather, salt and clockmaking trades. In 1583, a fire raged through the town destroying many of the timber-framed dwellings. Residents, although aware of the risks of building in wood, rebuilt most of their homes in timber. 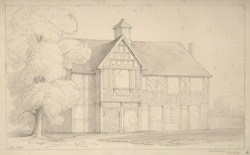 The house in this drawing probably dates back to that period.